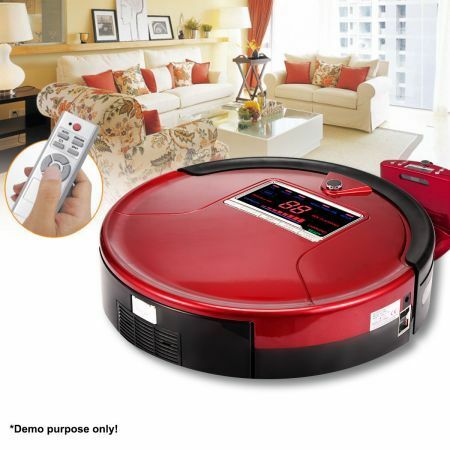 This 7-in-1 Robot Vacuum Cleaner is a cutting-edge robot cleaner that easily vacuums carpeted areas and also dry mops non-carpeted areas. This bagless vacuum cleaner is equipped with advanced features like a self-adjusting cleaning head that automatically traverses uneven floor transitions as it cleans carpet, adjustable speed, a virtual wall detector to ensure it stays in the area you want it to clean and much more. Sleek and compact, a simple press of a button on the remote control or the unit itself eliminates the toil of cleaning floors! Wall Tracking Sensor Ensures This Cleans Most Ground Surfaces Along The Wall. 35cm x 35cm x 10.5cm approx.